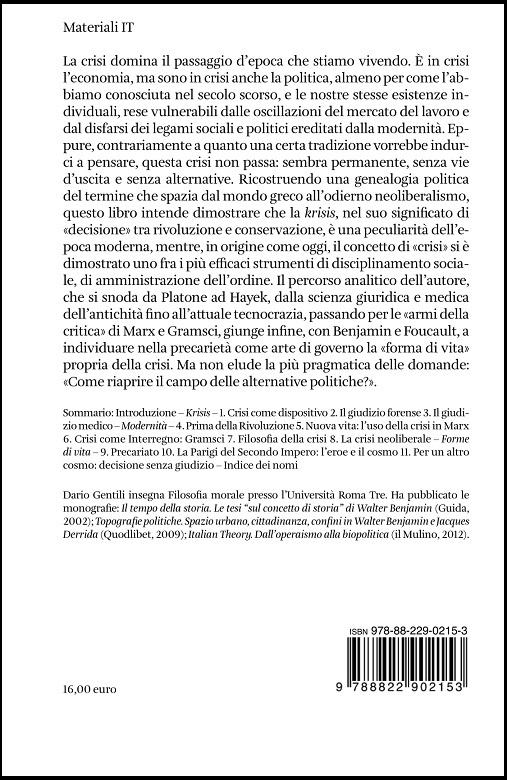 The new Materiali IT book series by Quodlibet aims to highlight the growing importance of contemporary “Italian Theory” or “Italian Thought” in the global philosophical scene. It will play an important role in stimulating and developing new ideas in this area of thought. The series publishes books written by classical and contemporary Italian theorists as well as books that aim to explore key themes in this field. 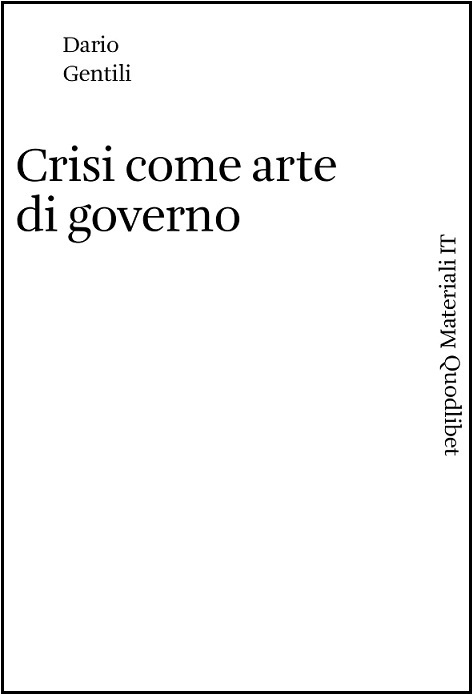 Materiali IT is particularly interested in publishing texts that examine theoretical problems through the lens of contemporary political issues. La collana Materiali IT di Quodlibet nasce dall’esigenza di rendere conto dell’importanza assunta nel panorama filosofico internazionale dal pensiero italiano contemporaneo (“Italian Theory” o “Italian Thought”), nell’intento di stimolarne anche la crescita e lo sviluppo. Oltre a lavori sui classici della tradizione italiana, in essa sono ospitati saggi dei maggiori autori italiani contemporanei e testi su alcune delle tematiche più discusse nei loro scritti. Peculiare della collana è inoltre intrecciare le questioni teoriche con i maggiori problemi di carattere politico emersi negli ultimi anni. 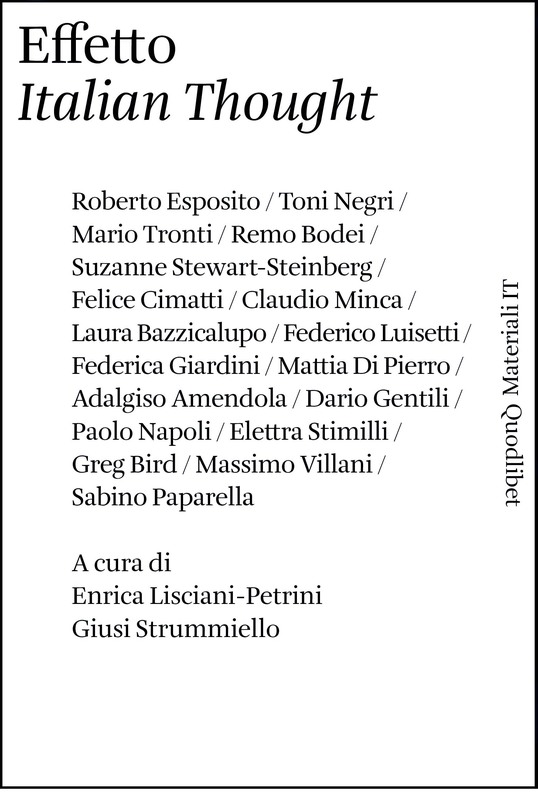 Editorial board / Comitato Scientifico: Paolo Bartoloni, Greg Bird, Vittoria Borsò, Sieglinde Borvitz, Timothy Campbell, Edgardo Castro, Felice Cimatti, Donatella Di Cesare, Gianfranco Ferraro, Simona Forti, Federica Giardini, Céline Jouin, Vanessa Lemm, Enrica Lisciani-Petrini, Davide Luglio, Federico Luisetti, Pietro Maltese, Danilo Mariscalco, Claudio Minca, Mena Mitrano, Marcello Musté, Elena Pulcini, Caterina Resta, Constanza Serratore, Suzanne Stewart-Sternberg, Giusi Strummiello, Davide Tarizzo, Miguel Vatter. The link between theology and politics has made a full force comeback, not just with the establishment of forms of Islamic radicalism, but also with a revamped centrality of the role of Christianity, and the traditional lifestyles inspired by it, in the “secularised” western countries. Although, as the texts collected in this volume try to demonstrate, politics and religion have a much more layered connection, mostly merged into the elaboration of the concept of “theological politics”, namely the theological origin of the fundamental categories of modern western politics. 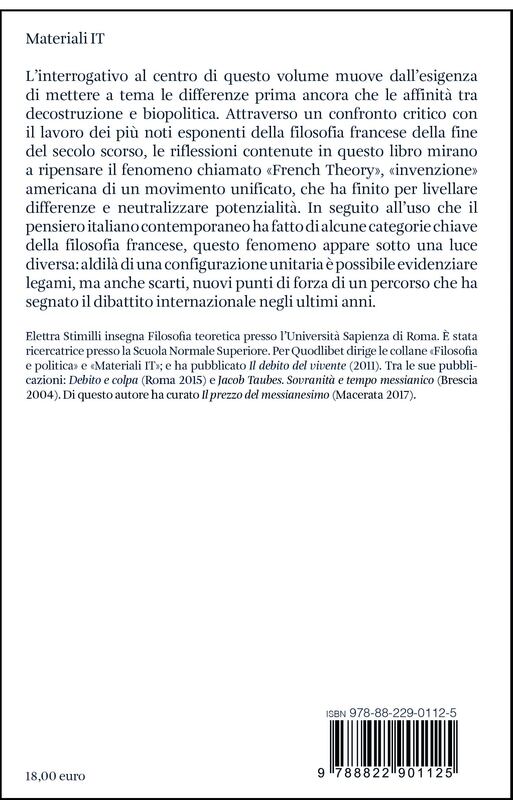 As it should be noted, this approach, clearly traced back to Carl Scmitt, and also Jacob Taubes, has enjoyed a privileged and precocious reception from Italian intellectuals/scholars, way earlier than other cultural environments. It is therefore within the realm of Scmitt’s theories and his critics that the contributions hereby offered attempt to figure out the link between religion and politics, through a three-step path corresponding to the book’s three sections: Theological politics and the Italian thought, The German debate and Critics on theological politics. The collective wish of the authors is to successfully interact with the plurality of theological discourses that are politically active as of now, belonging to monotheisms as much as to revolutions (it’s enough to think of the “political spirituality” that Foucault mentioned in regards to the uprising in Iran in 1978), and with the cross-linkages they present with the economical dimension – deeply influenced by the big recession started in 2008 –, the legal/judicial dimension, and the more properly political one. This volume of Effetto Italian Thought examines the centrality of the discursive practices in the contemporary debate in continental philosophy. From explorations of workerism (operaismo) and biopolitics, interrogations of life and human nature, to questions of language and gender, each essay unpacks core issues at the heart of Italian Thought, which is a way of doing philosophy that has gained much attention recently. Italian Thought has created a theoretical dispositive that generates “effects,” a field of tension between concepts of the horizon of politics. 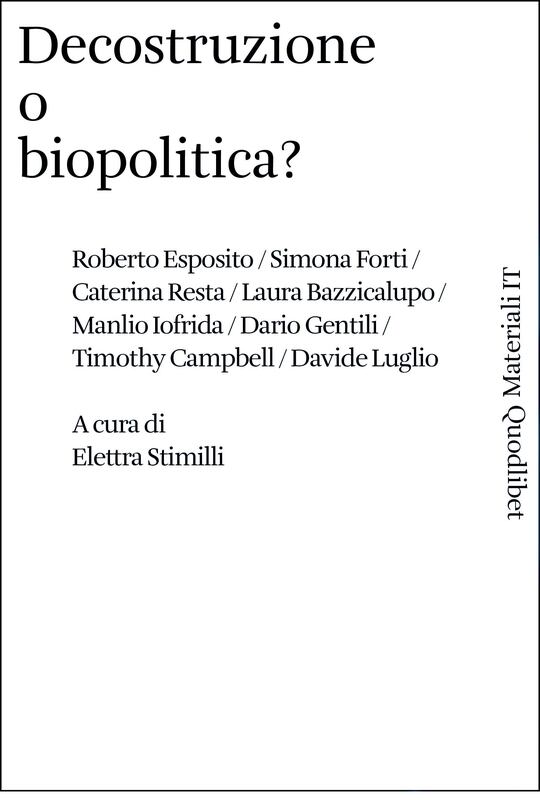 This volume begins with a lively exchange between Roberto Esposito and Antonio Negri on the role of affirmative thought in politics, followed by an interview with Mario Tronti. 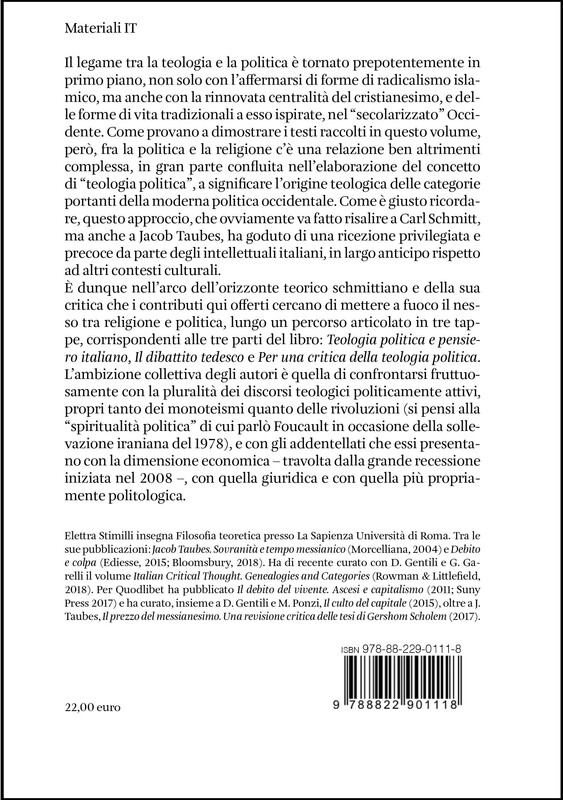 The first part is closed by an essay of Remo Bodei on the “impure” style of the Italian Thought. Parts two and three showcase some “effects” of Italian Thought through a variety of papers ranging from interventions to discussion papers. Suzanne Stewart-Steinberg analyzes Pasolini’s essay Abiura dalla vita. Felice Cimatti concentrates on the intersection of life and language in the Italian Thought. Claudio Minca studies the effect of the Italian Thought on the international debates in geography. Federico Luisetti focuses on the implications of the so called “Anthropocene,” the geological era in which humans have radically transformed the biosphere. 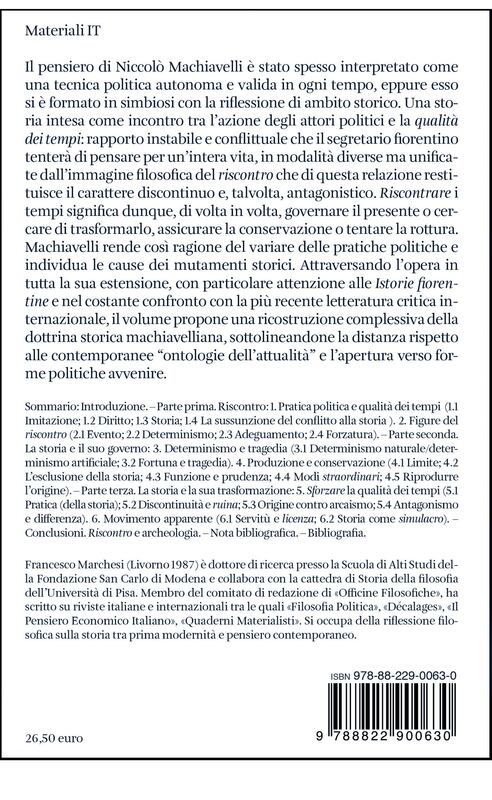 Laura Bazzicalupo’s essay, the dialogue between Adalgiso Amendola, Dario Gentili, Paolo Napoli, Elettra Similli, and intervention by Massimo Villani’s intervention address topics related to the economy, the law, institutions and norms, from innovative perspectives made possible by Italian Thought. Greg Bird employs the concept of immunity to offer an alternative perspective for examining global politics. Sabino Parapella reminds us that it is important to not overlook the “negative” within affirmative thought. Finally, Federica Giardini explores the relevance of “Italian difference” from the tradition of Italian feminism. 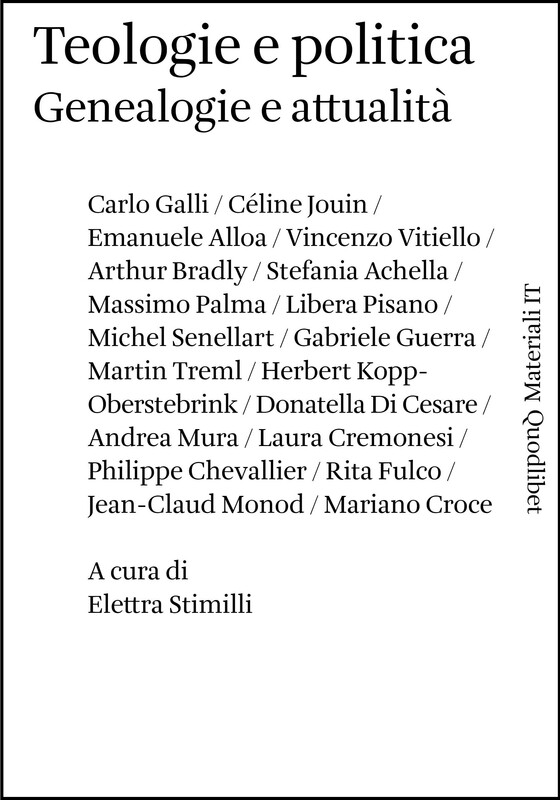 The volume concludes with a postface written by Enrica Lisciani-Petrini that draws together the historical and conceptual horizons that bring the essays into conversation with each other. The central problem of this collected edition is the exigency to focus on the affinities rather than the differences between deconstruction and biopolitics. Through critical examinations of well known late twentieth century French philosophers, the essays in this collection reexamine how the American invention of “French Theory” has been used to level differences and neutralize potentialities. Contemporary Italian Thought, on the contrary, draws attention to the significance of discord beyond its unity, links, and shared categories. It is this dimension that proves to be its strength and explains why it has become prominent in international debates. Machiavelli’s thought seems to be an autonomous and eternal political technique, but in his thinking can be found also a strict relationship between politics and history. Machiavellian historical practice is centered on the encounter between the “modi di procedere”, the action of political subjects and the “qualità dei tempi”, the historical conjuncture: a match expressed by the philosophical concept of “riscontro”, which suggests the discontinuous and, often, antagonistic nature of this connection. To encounter the times results, on a case, in governing the present or in an attempt of transformation, in an effort of conservation or in a try of subversion. Machiavelli’s theory accounts in this way the course historical development, with its breaks and its resistances to the change: an articulation of continuity and discontinuity, process and contingency, which leads to an original correlation between order and conflict, law and politics. The author of The Prince, in this reading, is not so much a republican citizen or the counselor of a tyrant, not a revolutionary theorist or an advocate of the reason of state, but above all an innovative epistemologist of history. 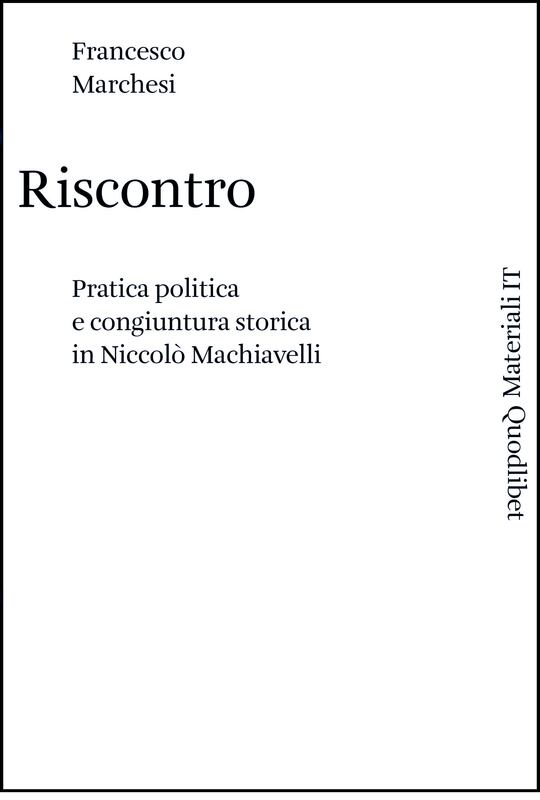 Analyzing the entire oeuvre of Machiavelli, with a particular focus on Florentine Histories, and in a careful confrontation with the latest international literature, this book proposes a whole interpretation of machiavellian historical doctrine, underlining affinities and differences with respect to more recent theories of history.